Let’s take a look at the term Next Gen Marketing Professional. It’s a somewhat grandiose title and the process to become one might seem daunting at first. Where do we start? We start with ourselves. We need to know our strengths and admit our weaknesses. We need to know ourselves and understand ourselves in order to transcend and evolve; to become Next Gen.
It’s quite simple, really. The world keeps changing and we need to follow suit. In a fast-paced environment of constant change we can’t get caught up in our own egos; we need to find our own place and contribute through the unique sets of skills and personalities we all have as individuals. We’re here to learn after all. Marketing is such a complex network of different processes and actions that trying to memorize and learn the right choices for each situation would be a fool’s errand. Instead, we need to understand what value we are creating and why, and then act accordingly. A lot of modern (and probably Next Gen) marketing is about empathy. Just as we need to understand how we as individuals can contribute to the processes, projects and teams that we are part of, we need to understand and see how the value we are creating fits into the life and everyday processes of the human being – or consumer in marketingese – that we aim to serve. In the extremely competitive world of modern marketing, there's a real demand for teams that produce excellent results. But how can we recruit the most passionate and well-motivated team players? Employer branding plays a significant role in bringing the right professionals to an organization. Just as satisfied customers help build a stronger brand, satisfied employees help build a strong employer brand. The brand image is built at every touch point with stakeholders. Digitality has not only increased competition, it has also forced organizations to be transparent. Marketing is not style over substance"
And why we are talking about it? As the new generation steps onto the field, they expect even more from their organizations. They are seeking organizations who treat employees well and offer meaningful tasks in a diverse working environment. They also expect to be allowed to develop themselves so they can stay relevant in an everchanging world. Well known business thinker Gary Hamel notes that organizations need to change as fast as the world in which they are operating (Helsingin Sanomat 2018). Marketing teams can't create an employer brand by themselves, it has to be the focus for the entire organization. Developing the customer experience starts in a real desire to understand the customer. The style of modern marketing leads to passionate teams who prioritize customers' needs. Modern customers are more interested in a company's values and they also expect a great customer experience. In a hectic world, they don’t have time to use complex sites, messages or services, and will choose the best platforms, services and messages that bring added value. The purpose of marketing is to create more value for the consumer or even exceed expectations. Fortunately, we are creating great customer experiences with a passionate and motivated DNA team! We have already learned a lot in a short time and we can't wait to see what the upcoming months will bring. The program gives us a broad vision of modern marketing and we hope that we can contribute and add value to those around us. 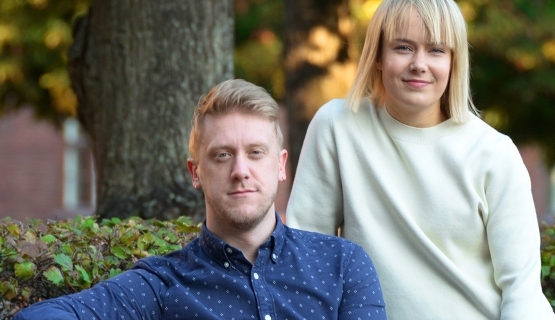 Julia Arko and Anton Söderberg are participating in Aalto EE's Next Gen Marketing Professionals program.